As behaviours are awarded to pupils in Class Charts, it may be useful to identify where positive and negative influences are occurring. Pupil interactions allows you to easily compare a pupil's typical behaviour to their peers and determine how well they behave together. 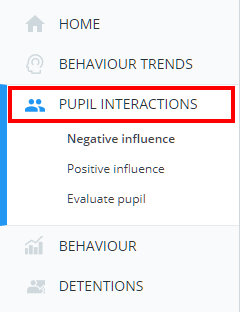 To view pupil interaction information, click on the Analytics tab along the top of the page. Next, select Pupil interactions from the left hand side menu. Select this option to display the pupils which have the biggest improvement in behaviour when seated together. Select this option to display the pupils which have the biggest decline in behaviour when seated together. Evaluating a pupil against everyone gives you an overview of how that pupil interacts with your entire school. Evaluating a pupil against a selected class lets you see how they interact with their peers. This information can be used to tweak your seating plans to minimise disruptive behaviour. Evaluating a pupil against another pupil of your choice allows you to see how they behave when seated together, when in the same room but not together, and when they are not in the same room.